Errol Spence Jr. put on a body punching clinic on Saturday night in stopping challenger Carlos Ocampo in the 1st round on Showtime Championship Boxing. The fight wasn’t supposed to be a competitive match-up, but it was briefly before Spence lowered the boom on the 22-year-old Ocampo (22-1, 13 KOs) in halting him with back to back body shots at the tail end of the 1st round. Spence’s fans were estate when Ocampo failed to get up off the canvas to continue fighting. 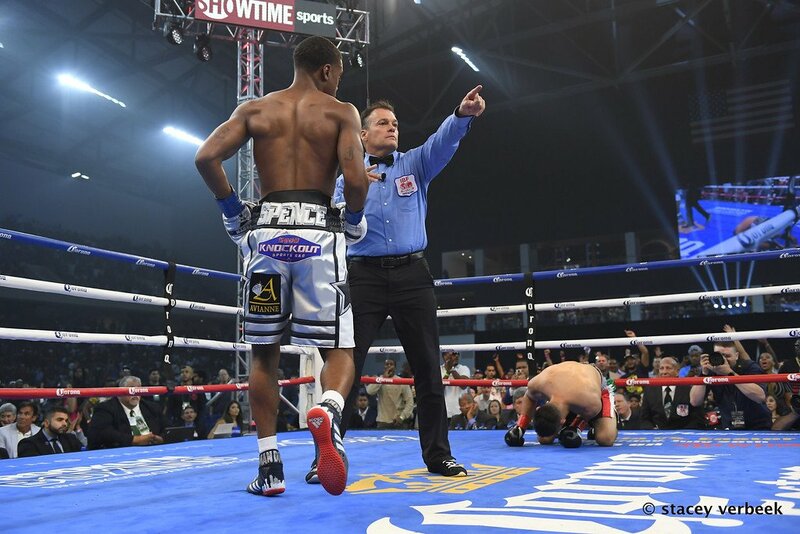 Fighting in front of a crowd of 14,200 fans at The Ford Center at The Star in Frisco, Texas, Spence (24-0, 21 KOs) stalked Ocampo around the ring looking to take his head off. Once Ocampo started throwing body shots, Spence returned first with two lefts at the end of the 1st round. Ocampo collapsed on the canvas after taking the two hard shots, and the fight needed to be stopped at that point. Referee Lawrence Cole gave the 22-year-old Ocampo the count and then stopped the fight at 2:59 of round 1. Ocampo tried to get up, but he pain was too intense for him to continue fighting. Both fighters exchanged body shots in the first minute of the round. Ocampo seemed to approach the fight with the intention of hurting Spence with body shots. It was a reasonable idea on Ocampo’s part, as most guys that fight Spence tend to head hunt as much as possible. Spence lost his patience with Ocampo when he was hit one too many times with body shots. Spence seemed to make up his mind in the final minute of the round that he was going to hit Ocampo as hard as he could with his own body shots. Once he did that, the fight ended quickly with Spence landed two successive body shots that sent Ocampo down for the 10 count. ‘The Truth’ Spence Jr. made a statement with this win. The body punching that Spence di in the fight will have the likes of Terence Crawford, Keith Thurman, Shawn Porter and Danny Garcia. Those guys now know what they have in store for them if they ever choose to fight Spence. It’s going to be hard for them to handle the body shots that Spence was landing. Ocampo may not have lasted very long, but he showed a lot of heart in trying to brawl with Spence. It was a crazy thing for Ocampo to do, but he must have figured it would be better for him to fight like a lion and go out on his shield rather than run and eventually get stopped anyway. At least Ocampo looked good briefly. The fight kind of reminded me of how Vanes Martirosyan looked good at the start of his fight against Gennady Golovkin last May. Golovkin got irritated after taking some hard shots from Martirosyan and promptly knocked him out in the 2nd round. With the win, Spence will now be able to take a voluntary defense in his next fight. Sadly, Spence’s voluntary defense will likely be a lot tougher than his fight against the woefully bad Ocampo. He wasn’t ready to fight someone in Spence’s class. It would have been nice if Ocampo had proven himself first by facing Samuel Vargas and Alejandro Barrera. Those two were knockout victims for Spence. I doubt that Ocampo would have beaten either of those guys.